For those looking for a small needle lace project to try, I wanted to tell you that the Sept/Oct 2011 issue of Piecework has a small needle lace medallion project that I translated. Silvia from Turin has made an exquisite needle lace medallion using beads and silk thread. I stitched it to make sure that my translated instructions made sense and used round silver hoop earrings instead. There is lots of potential for the imagination with this little beauty! This is Silvia's stitched model, mine is not worth showing you as my tension definitely needs a lot of practise! I can tell you that the medallion was quick and very enjoyable to stitch up! You can see what I mean about my tension needing practise as this is my attempt, but the heart design is all Silvia's. I hope she will treat us to more tutorials and projects on her blog. 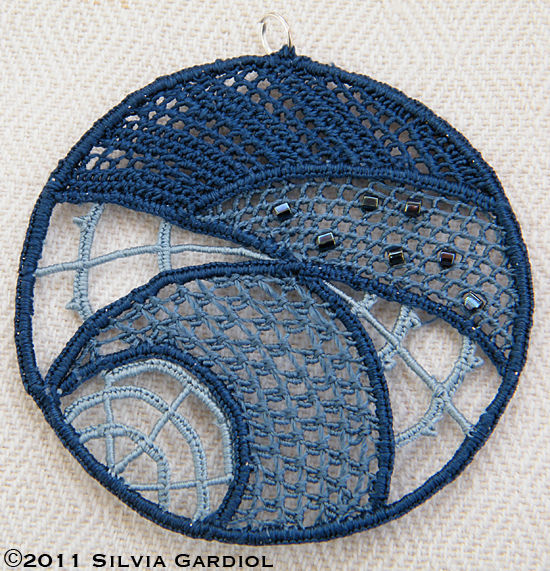 Check out her profile info to see another one of her delightful needle lace medallions! 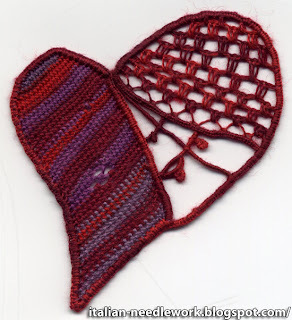 If you'd like to learn more about needle lace, Silvia has her own blog and she makes exceptionally clear tutorials!